Lotsa mysteries, including: Which girl gets the Duke? 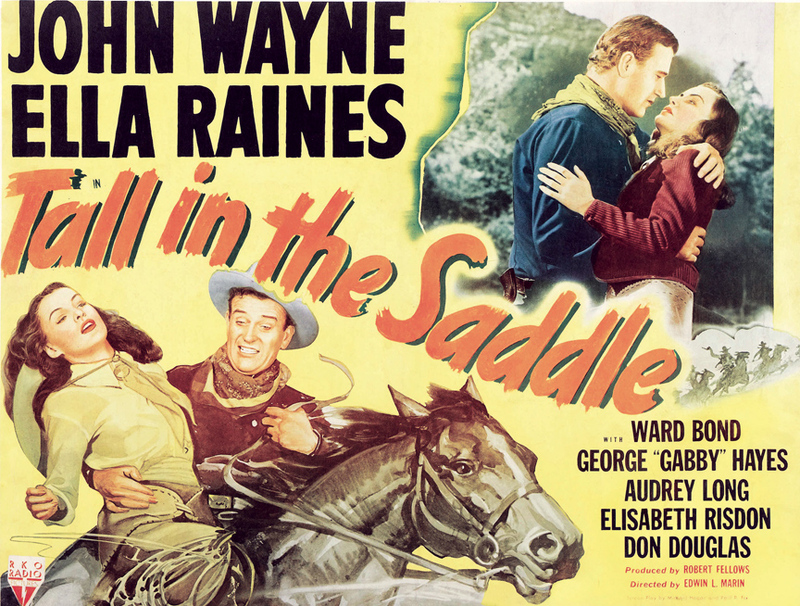 They call it a western, but “Tall in the Saddle” is really a mystery. The story is so filled with secrets, you must watch it at least twice to see where and how it fooled you. It’s also one terrific John Wayne movie, with some unforgettable Duke moments. Setup: Rocklin (Wayne) arrives at a train station, apparently expecting to be met. When no one materializes to collect him, he buys a stagecoach ticket to Santa Inez, asking to ride up top alongside the driver, a “grumpy old cuss” named Dave (George “Gabby” Hayes). Also on the stage are a demanding society woman (Elisabeth Risdon) and her demure niece, Clara (Audrey Long). The women are traveling west to deal with the estate of Clara’s rancher uncle who, Rocklin will learn, was shot in the back — and no one in this Peyton Place of the Old West seems in a hurry to find out whodunit. More and colorful characters enter the picture, such as Dave’s drinking buddy Zeke (Raymond Hatton); an iffy sheriff (Emory Parnell) and his iffy wing man (Paul Fix at his slipperiest); a seemingly gregarious lawyer (Ward Bond); a bussinessman (Donald Douglas) who operates a neighboring ranch on behalf of his step-children; and a suffer-no-fools bartender (Cy Kendall, playing a good guy for once). What’ll it be, Rockin? Lovely, demure Clara or, above, deadshot wildcat Arly? But the fiercest character Rocklin encounters is deadshot wildcat Arly Harolday (Ella Raines). Rocklin is generally a cool customer, but even he lets his vulnerability show when he walks away as Arly demands, “Turn around!” and fires off a few too-close-for-comfort shots at him. The phrase “smoldering eyes” was invented for Raines’ Arly. She is vicious, jealous, vindictive, controlling, scheming … and sexiness personified. (The way her chaps frame her cute little posterior seems very modern.) No man gets the best of her … until Rocklin comes to town. Which, of course, is why she wants him so badly. And even though sweet, unassuming Clara seems like a better match for Rocklin, we can’t help but root for Arly. Things look bad for Rocklin, at a murder scene more crowded than a Charlie Chan drawing room. 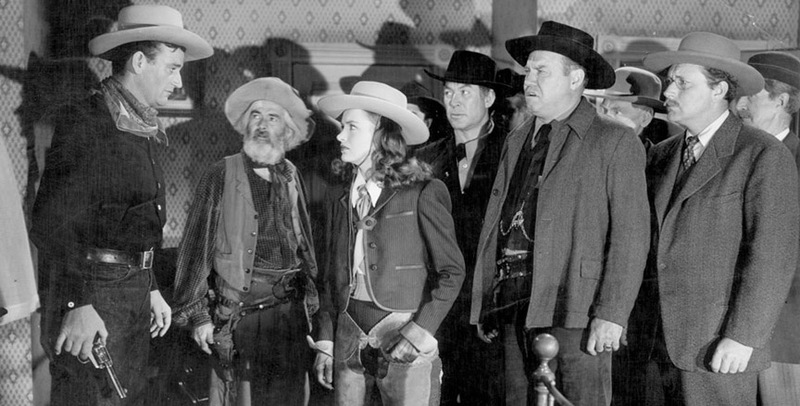 From left: John Wayne, George “Gabby” Hayes, Ella Raines, Ward Bond, Emory Parnell and Donald Douglas. As for those great Duke moments, there are two. During the brilliantly written and staged card-game sequence, an entitled young local (Russell Wade) cheats at poker; when Rocklin protests, the brat pulls a gun on him and scoops up the pot. What happens next deserves a place on Wayne’s eternal clip reel. I’ll say no more. Also, when Rocklin faces off against a recently sprung convict (Harry Woods) who is out for his blood, things get pretty tense. I’ll say no more. It’s great to see Wayne and Hayes working their singular mojo again. 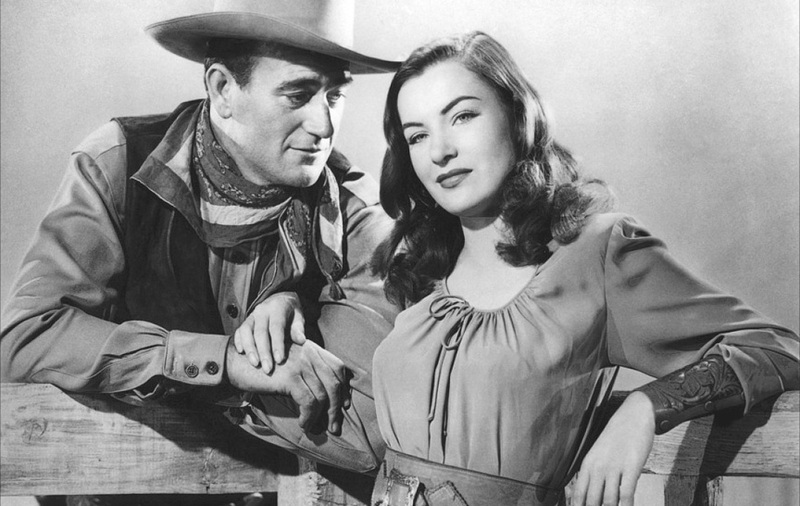 The two made at least 10 westerns together prior to “Tall in the Saddle,” including a bunch of those charming, early, low-budget “oaters” for Lone Star. “Tall in the Saddle” was directed by Edwin L. Marin, a Jersey City native who helmed some classics and near-classics, such as “The Death Kiss” (1932) starring Bela Lugosi; the early Sherlock Holmes talkie “A Study in Scarlet” (1933) starring Reginald Owen; the 1938 “A Christmas Carol” with Owen as Scrooge; Universal’s improbably patriotic horror flick “Invisible Agent” (1942) starring Peter Lorre and Sir Cedric Hardwicke; and three George Raft noirs, “Johnny Angel” (1945), “Nocturne” (1946) and “Race Street” (1948). This is one of the few times Arly Harolday ever dropped her gun.